Public health and maritime health have been joined since America's earliest history. Colonial Americans recognized that diseases arrived on their shores brought by foreign ships and sailors. In response to a severe outbreak of yellow fever, in 1798 President John Adams signed the first Federal health law, "An Act for the relief of sick and disabled Seamen." From this act grew the Marine Hospital Service and the birth of modern American medicine. 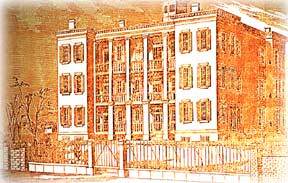 Privately-built and -operated hospitals for mariners quickly developed in the major seaports of the Atlantic coast. In 1836, Kentucky Senator Henry Clay led a movement to provide marine hospitals to America's inland rivers and lakes. Administration of the marine hospitals became the responsibility of the U.S. Treasury Department which collected customs and provided funding for the hospital service. At the outbreak of the Civil War, the Marine Hospital Service operated 27 hospitals. Following the war, President Ulysses S. Grant created the Bureau of U.S. Marine Hospitals and raised monthly fees for sailors from 40 cents to 60 cents a day. Operated as a military department, the Bureau adopted strict standards of hygiene, de-contamination procedures, standardized medications and nutrition. An outgrowth of the Bureau was the Laboratory of Hygiene, an innovation that would eventually become the National Institutes of Health. In 1939, President Franklin Roosevelt consolidated the Bureau into the new Public Health Service and moved it out of control of the Treasury Department. The seal of the Bureau of Marine Hospital Services reveals the organization's goals. The design is of an anchor, crossed at right angles with the Caduceus of Mercury with two serpents entwined on staff. The latter is the sign of the pacifier, carried by ancient ambassadors as a sign of truce and peace.